Tonight we’re eating lime and herb marinated mahi-mahi baked on a bed of fennel root, onions, thyme and parsley. The mahi-mahi is served on top of sunflower sprouts tossed in a ginger-lime vinegarette. 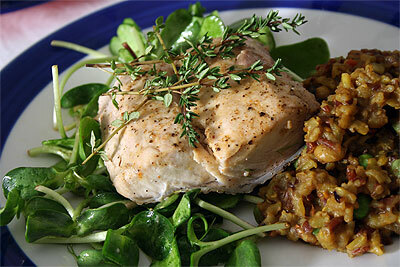 Curried old world pilaf accompanies the the fish to create a well balanced and healthy meal. T: That sounds really good. And it was. A: I’m glad you enjoyed it. I thought it was pretty darn good myself. And definately a meal that doesn’t make you feel like you need to workout because you just ingested 1000 calories. T: It is nice to be eating fish. I’m a fan of it. A: yeah I’m a huge fan of all sorts of seafood. It’s good to finally be budgeting it into our dinners. T: It’s fun to be eating sunflower sprouts, too. A: I know, they make me grin, and look so cute. Everytime I see them it’s like looking at a little kitten or puppy. A: that’s not the first time I’ve been told that, Mr. T. I feel like you’ve called me weird on the blog in the past week. T: you’ve been weird. Maybe you’re just getting weirder and weirder. A: or maybe you’ve been getting further and further removed from reality, and I’m the sane one. T: You see what I’m talking about? You’re saying all the bizarre things, weirdo. T: – woah, there. Simmer. A: If you had let me finish my sentence I was going to say, alright freak, let’s get back to the food. So, specifically, what were your likes and dislikes? T: I enjoyed the fish the most, I would say. Hmmm… I’m not feeling too talkative. I enjoyed mixing everything together in one bite. A: that was definately the way to go. The elements were created to accent one another, so when they’re eaten together it creates a pleasant experience. T: it was. I’m not used to wild rice. I’m not crazy about it, although with enough exposure I could come around. A: All in due time, my pretty, all in due time. Moo ha ha ha….. So, what’d you give it? T: I give it an 8.3/10. A: it’s unusual that I like things more than you do, but this meal I give an 8.53/10. T: yeah, I think that’s the first time you rated something higher than I did. A: I really enjoyed the pilaf, as well as the fish and sunflower sprouts. It worked for me. It still wasn’t a 9, but it was certainly a mid 8. T: Well, I welcome fish eating with an open mouth. T: is there anything you would do differently next time? A: yeah, there is something I’d do differently. I would marinate the mahi-mahi longer and I would have added salt or something with salt in it to the marinade. The mahi-mahi was really good, but it could have been seasoned a little further than it was. I thought the ginger-lime vinegarette was awesome, though. It played a small part in the meal, but it got me going. T: it was tasty, fresh, lively. A: just like you, huh? T: ummm, have you tasted me lately? THIS IS SO SO GOOD!!! Y U NO POST RECIPE? Argh! I want to make this tonight. Any chance you can post the recipe? Everything I’ve made from your site has been a smash hit in my household – and when the boyfriend is happy, *I* am happy!